I type the word “Match” as a working title for this post and the dating website comes to mind. Finding the right match can change your life! Today, I received a phone call that, if a particular match is right, could indeed change someone’s life. And no, it has nothing to do with dating. A few years ago, I had registered with the National Marrow Donor Registry. I have some knowledge of bone marrow transplants, and knew quite a few transplant recipients when I was working in the field of oncological social work. I also knew some patients who needed (but never received) a transplant because no suitable donor could be found. 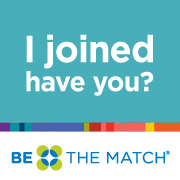 I finally got more information and contacted the Registry at www.BeTheMatch.org. Even though I knew the basics of the transplant process, I read up on the procedure. I knew that I would always have the chance to remove myself from the Registry if I so wished, and if I were contacted as a potential donor, I could still opt out. Yes, it’s more involved than donating blood, but the process of getting on the Registry is easy. I knew when I signed up that I might be contacted, and today I received a call informing me that I had been identified as a possible donor match for a lady with Acute Myelogenous Leukemia. (I’ve read that about half of one percent of people who register are identified as a possible match; even fewer of those become donors.) One can be a possible match and still not be a donor because of a number of reasons, so I don’t know where this journey will lead. What’s important is the best possible outcome for the 70-ish year old lady for whom I am a potential match, and if that’s me, then I’m in. Early 70’s? She’s young, and has a lot left to do in life! I don’t know her, but I want to help her. I’m betting there are people who love her, and that she loves and wants to stick around for. So, the next step for me is a repeat cheek swab test, and if her doctor determines I’m still a possible match, we follow up with blood tests, physical exam, etc. for further screening. I also know that my own journey, even if I do wind up being a donor, will be nothing compared to hers. Or perhaps it’s because each year, when the Registry contacts me to confirm or update my contact information, I prayerfully consider and renew my commitment. I say yes. Yes to God, yes to whatever is in store, knowing that whether I ever serve as a donor or not, my being available brings more hope to people who will be searching for a match. Find out more about being on the National Marrow Donor Registry at www.BeTheMatch.org.